Long before Stacey Humes was an instructional partner at Discovery she was an awesome English teacher and mentor to the students in her class. Her success as a teacher wasn’t really a surprise since her love of teaching began early. As a child Stacey always was the one who wanted to play “school” with her friends. 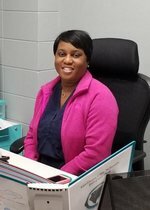 Her professional education career finally began in Decatur following completion of her Master’s in Education at Alabama A&M. Eighteen years later she is living out her childhood dream as a National Board Certified teacher helping other teachers to sharpen their skills here at Discovery Middle School. Stacey’s journey to National Board Certification began when a NBC teacher in Decatur introduced her to the Five Core Propositions of teaching. Becoming a mother and changing schools delayed her for a while, but eventually she decided together with her friend and DMS co-worker Tanya Breeding to “just do it” and begin the process. Stacey said she had become complacent and needed a challenge to take her to the next level. 1. Get to know your students. The first 2-3 weeks of class are crucial in your relationship. 2. Focus on your student’, make sure that you design lessons for their learning styles and needs. 3. Get started early, at the beginning of the year, with your plans for certification. Read through everything and read it again for clarification. Read and highlight to understand what each component entails. 4. Seek out a buddy or join a group. In Madison City we are lucky to have a strong mentor group. This type of community approach is ideal. 5. Don’t think about it, just do it.